Town with almost 5,000 inhabitants, it is the best known medicinal bath in Hungary, with important tourism. The thermal lake with a surface of 44,400 m² is the second largest lake with peat bottom in the world. The medicinal water gushes out from a 38 m deep spring crater, its average temperature in summer is 33-35 °C, but in winter it is not less than 23 °C, so one can bathe outside all year round. The water of the lake has a special curative effect on the different kinds of rheumatic, locomotor, muscle, and nervous system's disorders and gynaecological problems. The cure in Hévíz is not only for rehabilitation but it also serves for prevention, relaxation and recreation. The therapeutic effect of the water that has sallied forth since several ten thousands of years, was known as early as the Roman times, however, the first public bath was built in commission of the owner Count György Festetics in 1795. By the landlord, edifices were constructed and a constant medical supervision provided. In 1800, 500 guests were registered in contemporary documents. Soon visitors from Austria and Germany came to Hévíz, too. The number of the visitors of the lake bath is more than 2 million a year today. In major hotels, almost any kinds of therapy are available. The lake and its environs with a park and an alder wood is a nature conservation area. The Roman Catholic chapel in Egregy district was built in the 13th century, it is a listed monument. In Hévíz besides the full range of medical services there is a great variety of cultural programmes: e.g. the vintage festival in Egregy in each year. It is the most popular programme among visitors. In 1998 Hévíz was awarded a silver medal in the "For Flowery Europe" competition. Library, cinema, gallery, museum of regional history await visitors in the town. A new sight in the part of the town called Egregy is the villa from the early imperical period, the restoration of which started in 2001 and which is open to the public from September 2004. The art groups of the town are famous: the Musica Antiqua old music ensemble, Hévíz Dance Studio and the Town Brass Band. The new church, the impressive Town Hall, the sport centre and the new shopping mall are worth visiting. The Anett's Villa is situated in one of Hévíz's most flowery and wonderful streets, in a peaceful, natural environment, yet not far from the lake and the town centre. This hotel, which has a new name but looks back upon hundreds of years of therapeutic traditions, was constructed in 1871 by the count György Festetics on the western shore of the Gyógytó (Medicinal Lake) at the foot of Hévíz Hill. Our hotel is located close to the thermal lake of Hévíz (300 m). It's open all year round and waiting for you with high quality services. The hotel offers - in addition to the traditional health preservation cures - also different fitness, wellness and beauty packages. The biggest thermal lake of the world is located in Hévíz, close to lake Balaton. Only 500 m from the well known thermal lake is situated the 4-star superior Spa- and Wellnesshotel Danubius Thermal Hotel Hévíz, where a highly educated team takes care of your feeling well. The newly built Palace Hotel Hévíz emerges from the picturesque surroundings of the Hévíz Thermal Lake, which is famous for its magnificent, curative water. The hotel is situated in the pedestrian street of Hévíz, 200m far from the Thermal Lake. 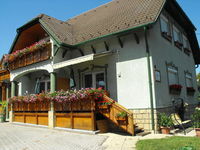 Apartement Prestige: exclusive recreation in Hungary. Spend your holiday in a de luxe apartment in the elegant brown-stone district of the town approximately 800 meters away from the Thermal Lake. Total capacity: 25 Persons. The hotel was built in 1927 and it has been operating with 30 rooms. The comfortable, cosy rooms are equiped with own bath, minibar, colour TV, telephone,safe and hairdryer. The Centrum Apartment House is Heviz' s exclusive apartment house, with 16 hotel level 41-80 square meter apartments waiting for their guests longing for curing, relaxing and recharging. The 20 elegantly furnished apartments are situated only 10 minutes walk from Europe's largest thermal water lake in a very calm and wonderful natural surroundings in Hévíz. The at the beginning of the year 2008 completely renewed Spa & Wellness Hotel Fit**** can be found 300 metres from the unique Medicinal Lake of Hévíz, in a central, but quiet district. The Gelencsér Pension is located about 700 m from Europe's largest and famous thermal water lake in the Villa District of Heviz, in a peaceful natural surroundings, near the vineyards. Hotel Sante waits their guests in the centre of Hévíz, but still in a quiet and calm environment. Thanks to its favourable location it is easy to reach (takes 5 minutes on foot) the only warmwater lake in the world, Lake Hévíz. The Relax Apartment House is Heviz's exclusive apartment house, with 10 hotel level 55-75 square meter apartments waiting their guests longing for curing, relaxing and recharging. Besides the high standard accomodation, elevator and garage are to serve the perfect comfort and relaxing. The Hunguest Hotel Panorama awaits the guests who are looking for health cure and recreation all the year in the proximate neighbourhood (only 100 meters) of the world-famous thermal lake of Spa Heviz. The Holiday Club Heviz hotel is located in a quiet street of Heviz and offers you air-conditioned apartments with kitchenettes, an indoor pool, fitness facilities, a sauna and a jacuzzi. The Orsolya's Apartementhouse is situated in Hévíz / Hungary, 800 m far from Europe's largest thermal water lake. It has 1, ca. 50 m. large apartement on high hotel standard, which is an ideal choice for all, who look for accommodation of high quality with optimal situation for an unbeatable price. The Hotel Villalux enjoys a quiet location in Heviz and offers you rooms with balcony, cable TV and free Wi-Fi, as well as free parking on site. Hunguest Hotel Helios***superior is situated in the middle of a 4,5-ha-large well-kept nature conservation park, 500 m far from the thermal lake. The Hotel Európa Fit ****superior is located in a green area of Hévíz, in the heart of a peaceful oasis only 400 m. away from the biggest hot water spa in Europe. The hotel, which has opened its doors to the public in May 2000, is the paradise for all who are searching for recreation! The Exclusive Apartementhouse is situated in Hévíz / Hungary, only 100 m far from Europe's largest thermal water lake. Our apartment house Kék Villa is located at just 250 meters from the world famous lake Hévíz, which has 200 years tradition of therapy. The hotel is located directly at the entrance of the thermal bath. Your comfort is guaranteed by 48 tastefully furnished hotel rooms, out of these; three rooms are enlarged with living rooms. The Fortuna Apartementhouse is situated in Hévíz / Hungary, 800 m far from Europe's largest thermal water lake. It has 1, ca. 50 m. large apartement on high hotel standard, which is an ideal choice for all, who look for accommodation of high quality with optimal situation for an unbeatable price. Centrally situated in Heviz only 800 metres from the thermal lake of Heviz, Hotel Amadeus offers rooms with free Wi-Fi and cable TV. Free parking on site is provided. Enter the Lotus Therme Hotel & Spa where, under the sign of the lotus blossom, old and new types of knowledge enter into a caring symbiosis and provide for your well-being.